Nearly 100 would-be business owners turned out to get an inspiring message from local successful business owners this week, thanks to our “Just Start It” events. 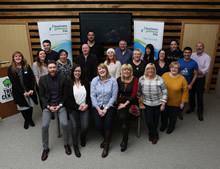 The evenings were held in Glenrothes, Dunfermline and St Andrews so that people thinking about starting a business could be inspired and encouraged by successful businesses who have been on that journey. David Austin of Reubens, Donna DuCarme from Looking Lass Productions and Janet Torley, Events for Business spoke at the Dunfermline event in the Carnegie Conference Centre. Lorraine Gardiner and Nadia Moreland from Love Restored, Aaron Andrews of Arro Lighting and Karen Logan from The Twa Hens Cafe were the guest speakers at the TREE Centre, (Tullis Russell) in Markinch. And Owen Hazel from Jannettas and Katherine Smith from Eden Legal were at the Hotel Du Vin in St Andrews. The audience were able to ask the guest speakers all those questions they really want answered, to help them take the next step to get started.